Review Summary: Sechnsucht builds on catchy choruses and obscure ideas, creating a sound that is both unsettling and thoroughly enjoyable. With Herzeleid leaving a mild impression on the world; thanks to the help of the album cover causing controversy in the U.S. and David Lynch for putting the tracks "Heirate mich" and "Rammstein" in his 1996 Thriller, Lost Highway, Rammstein had set up the core foundations of the bands sound and were ready to unleash a successful follow-up. In 1997 the band really got heads turning when they began work on their second full length album, Sechnsucht; releasing "Engel"and "Du Hast" as singles not only got them massive exposure worldwide, but it also helped the performance of their previous album. Sehnsucht leaves behind the techno influenced sound found on Herzeleid into a more industrial based arena; blending influences from Ministry, Nine Inch Nails and Skinny Puppy. But what Rammstein managed to create was something that not only had all the key factors to an industrial sound, it brought infectious hooks. The album is littered with catchy melodies: "Du hast", "Tier" and "Alter Mann" all bring the kind of melodies that would lure new fans in, make for awesome live shows, and still provide a sound pallet that would appeal to the fans of the debut as well. The album masterfully mixes pop choruses with the underground weirdness the band was playing with at the time. "Spiel mit mir" starts off very unsettling, with Flake’s droning electronic sounds and muffled laughter in the background, before kicking into an almost laughable keyboard lick that drives the verse - it sounds very Frank Zappa-esque odd, but sets a disturbing tone perfectly - before shifting into an extremely accessible chorus that will leave more than a lasting impression. "Klavier" is another one that manages to pull all these abstract ideas from various places and making them work cohesively: starting off almost as a ballad, before kicking into a rapidly played guitar riff, before shifting back into the soft verse again. It’s these ideas that make the album so damn interesting, and it’s because of this that the album stays with you well after you’ve listened to it. 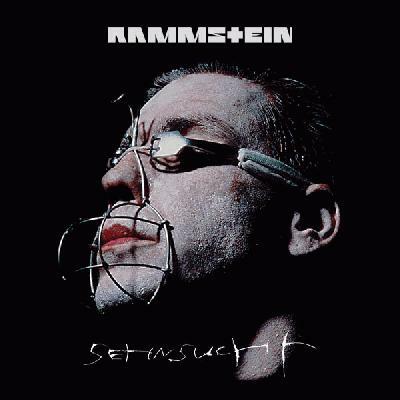 Rammstein’s second album is their most experimental effort to date; it’s aim is to pull at several different emotions at once. "Kuss mich (Fellfrosch)" pumps out a fat, distorted chugging riff that drives the heart of the track, while Flake plays a wacky selection of samples. Listening to these sorts of songs creates an energy that gets your adrenaline flowing, while simultaneously sending the creeps into you. It’s an odd and unique experience, and one even the band hasn’t been able to replicate since. But for all the crazy ideas floating around this LP, there are some grounded ideas. "Alter Mann" is one of the most accessible songs on the album and shows signs of the Rammstein to come, while tracks like "Buck dich" and the title-track bring the hard-driving sounds from their previous album. And while all these ideas would make a person question consistency and tone, fear not, every track on this album provides the same tone that will stay with you from start to finish. Richard had a vision to create a band that blended heavy guitars with the sound of machines, and that’s exactly what he got with Rammstein's sophomore release. The album feels unhinged, cold and mechanical, but has a wild energy and life to it. Probably the most difficult release to get into from the bands discography, but if you stick with it you’ll be rewarded the most from it. "Sechnsucht moves the band into a much more industrial arena"
Little spelling mistake there. Otherwise good review, though maybe a little bit too much information for that length. Album is great, but suffers from its monotonous sound and therefore never reaches the heights of the early 00s work. Du Hast is still as massive as it always was. Will correct cheers kris. However, I disagree with it being monotonous, this album is a grower for sure. I was never massive on it back in the day but it's bloody good these days. Agreed tuna.Alter Mann is awesome too. This has always been my least favourite Rammstein, there's more on here that I find annoying than any of their others. Awesome review though, pos'd. Gonzo, it's not the album on the whole that's monotonous, though at least Eifersucht is definitely a "we've heard it before" song. It's just that thanks to Flake and that heavy production all those tracks start perfect, but after about one minute into the song there's just not much going on anymore. The album is remarkably consistent and precise, but it just lacks the extra bit for me. Least favorite, right up there with Rosenrot. "Bestrafe Mich" is the heaviest track here for me. I love that riff. After Herzeleid leaving a mild impression on the world, thanks to the help of the album cover causing controversy in the U.S. and David Lynch for putting the tracks Heirate mich and Rammstein in his 1996 Thriller, Lost Highway, Rammstein had set up the foundations for the future. In 1997 the band really got heads turning when they began work on their second full length album, Sechnsucht, releasing Engel and Du Hast as singles not only got them massive exposure worldwide, but it also helped the performance of their previous album. "Spiel mit mir starts of very unsettling,"
"From various places and still makes them work cohesively"
and it’s because of this the album stays with you well after you’ve listened to it. "of this that the album"
It’s a no holds barred of ideas that aim to pull at several different emotions at once. A no holds barred what? A no holds barred good time? Great album? there are some grounded ideas, Alter Mann is one of the most accessible songs on the album and shows signs of the Rammstein to come, while tracks like Buck dich and the title-track bring the hard-driving sounds from their previous album. Richard had a vision to create a band that blended heavy guitars with the sound of machines, and that’s exactly what he got with their sophomore release. You begin this sentence mentioning one band member only, therefore "their" needs to be replaced with "Rammstein's"
but has an equal part of wild energy and life to it. "but has a wild energy and life to it"